I’m doing a lot of work around the Teachers’ Standards at the moment. I’m such a visual thinker and I always love a nice bit of typography, I’ve had a go at creating some graphics to support what I’m up to. By raising the profile of them and finding ways to integrate them into all things teaching and learning, my hope is that teachers can take control of them and drive and ashape their CPD accordingly. This entry was posted in Expert Pedagogue, Inspiration by fullonlearning. Bookmark the permalink. They look so much more friendly like this! Can I steal a copy for the staff room? 🙂 K.
Yes, I love them and wondered if I could have a copy / use them for the staff room too!! Making them visual like this makes you so much more inclined to engage with the content….just like everything we do! Go for it! Download from the Pop-Up Resource page. Oh I love these! Can I link them to my page for Trainees and NQTs? Taking these to the Governors Meeting tonight. Thanks Zoe. We’re reviewing the Appraisal/capability policy!! These are splendid! I’m a PGCE student and I’ve saved them as a background to Penultimate, the handwritten note-taking tool on my iPad. This way, if I ever want to reflect on meeting the teaching standards, I can take a new page and scribble all over them. Ooh, I like you’re approach! I’ve got the, printed and hanging in my office at school which is also out T&L Lab. They look better on screens than in print format – lesson learnt there! Thank you for taking the time to leave a comment. I hope your PGCE year is going well. 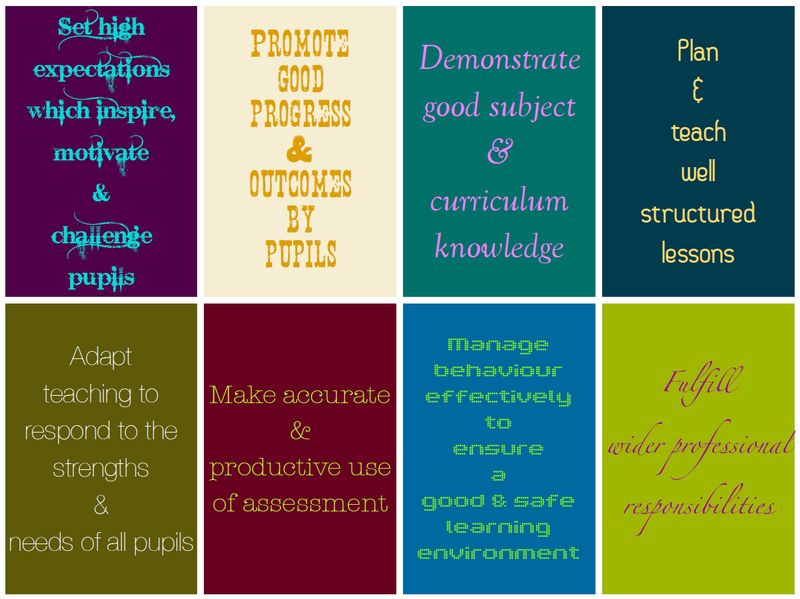 I know some people have used the Teacher Standards to take a marginal gains approach to development targets. See http://www.marginallearninggains.com for more details. If you break down the TS into discreet, specific and concrete targets, it works really well. Let me know if this helps at all?